Remember in the early Facebook days how you’d get poked all the time? And it was incredibly awkward? Like, what was that even supposed to mean? I remember getting poked, and being like, “Ew. Don’t.” They never got poked back, and I was okay with that. Speaking of OKAY, I do realize that in this case, the word poke is pronounced “poh-kay.” You’re sitting there totally convinced I was a complete idiot. Wait, I was supposed to stop saying bae this year, wasn’t I? Oops. So this is the deal. Yes that is raw tuna. But that’s the way you eat it! Sashimi style. But what you WANT to do is buy “sushi-grade tuna” from your best source. I got mine at Whole Foods, but I bet your fish monger would have some good stuff. I pretty much just like saying the word monger. Cut up the tuna into bite-sized chunks, and let it sit for a sec in a simple marinade of soy sauce, sesame oil, sriracha sauce (sambal oelek is fantastic in its place), a pinch of brown sugar and lime juice. While that sits, dice up a bit of cucumber, along with an avocado and a few scallions. All the good things. Once your goodies are prepped, you’ll slide half of each into the tuna bowl and give her a little toss. It’s good for the soul. Oh! Make some white rice. Jasmine is just fine. Aaron had some already made from the day before, so it was a last-second idea, and one that I’m most certainly delighted about. Rinse some butter lettuce leaves. Or Boston, or Bibb, or any of those tender head lettuces because they all look the dang same. Rinse rinse rinse, then pile a little bit of rice and tuna mixture into each cup, which . . . I’m sure is obvious. THEN, sprinkle the lettuce cuppies with the remaining cucumber, avocado, scallions, and some pretty sesame seeds. If you can’t find multi-colored seeds, you’re still a good person. Have some lime wedges on the side for extra squeezage. You know how I like extra squeezage. This is getting awkward. But not quite as awkward as getting poked. EW. WHY. Try this! It’s light, it’s tangy, it’s different. Shake it up ’round der. 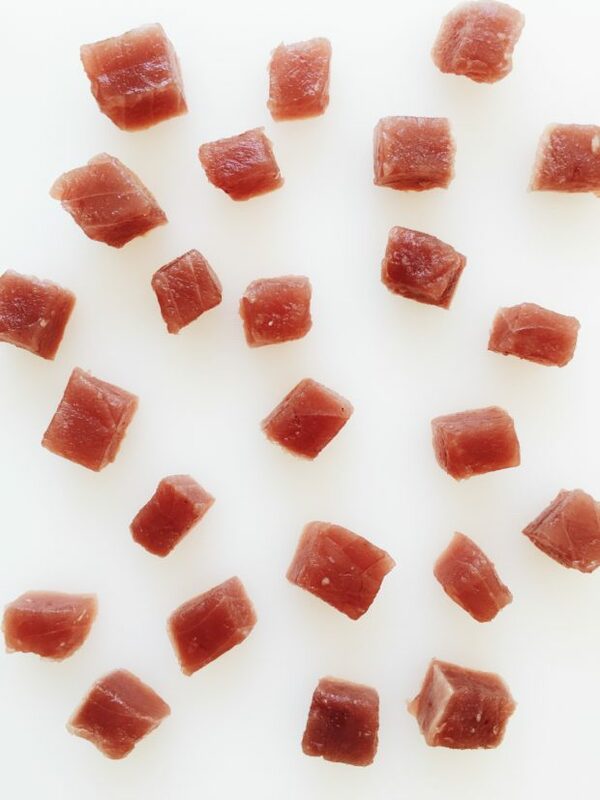 Dice the tuna into bite-sized pieces. In a medium bowl, whisk together the soy sauce, sesame oil, Sriracha sauce, lime juice, and brown sugar. Transfer the tuna to the marinade and let sit for a few minutes, while you prep the rest of the ingredients. Once the ingredients are prepared, add half of the cucumber, avocado and scallions to the bowl and toss. 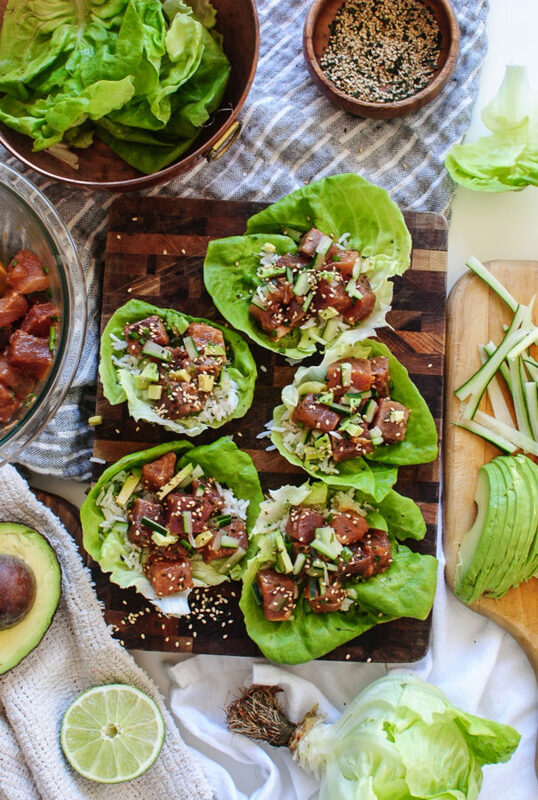 Fill each lettuce cup with a tiny bit of rice and a small mound of spicy tuna. Then top with the remaining cucumber, avocado, and scallions. Sprinkle with sesame seeds. 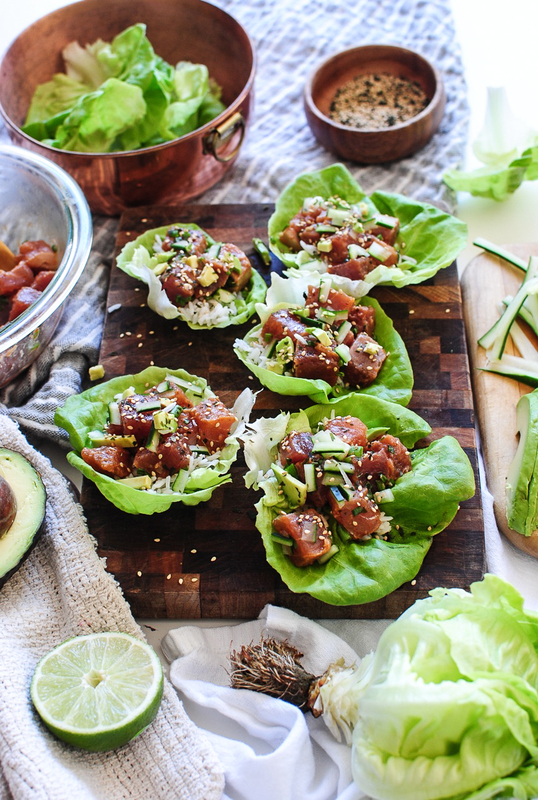 Serve the lettuce wraps with extra lime wedges! Always. I loooooove raw tuna but am so scared to make it at home because I don't know anything about the quality or freshness of the fish. I'll have to head to Whole Foods to make sure I get the good stuff! 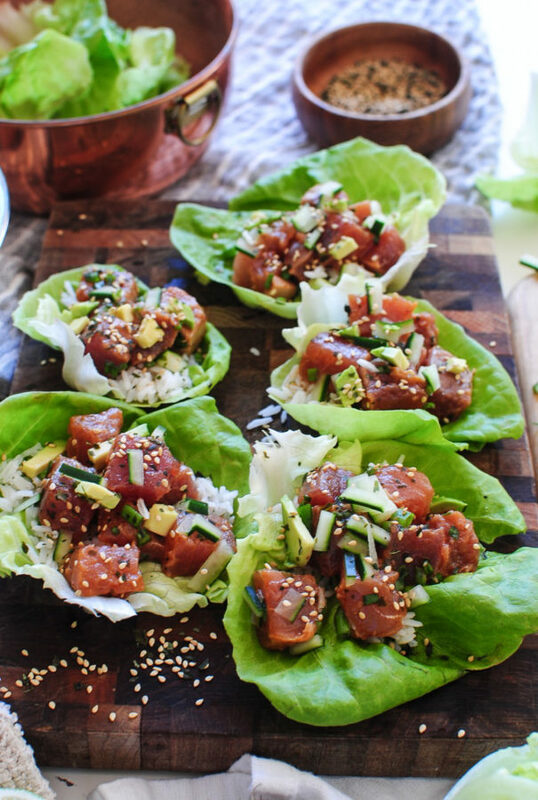 I made poke bowls one day last year to attempt to relive our Hawaii vacation the year before, and went to Whole Foods for the sashimi grade tuna. After 20 minutes in the fish section, the woman finally told me it was in the sushi bar. And that ish was 45 dollars a pound! It may be expensive, but it's so good! 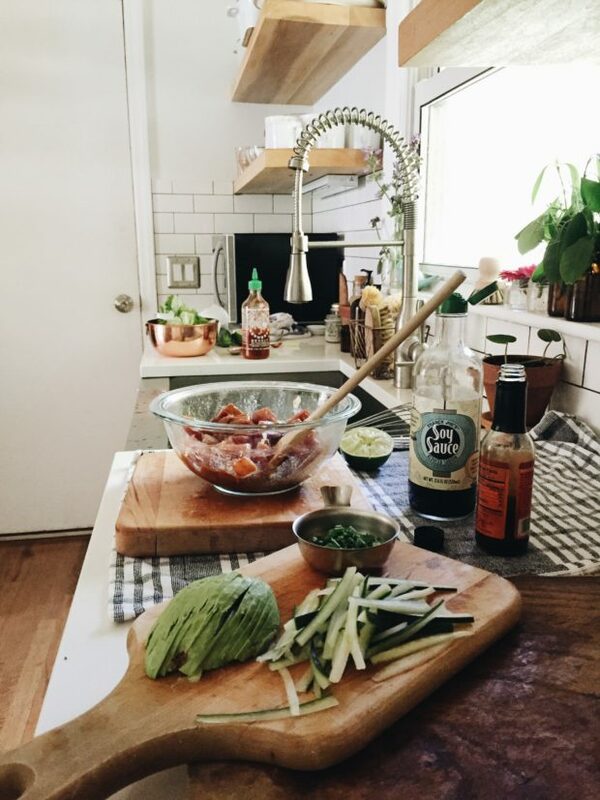 I love the idea of doing lettuce wraps instead of throwing it in a regular bowl. I might have to splurge and get some more sashimi grade fish soon and make them this way. Oh my goodness! I'm making this this weekend and if my husband is lucky I might share. I wish you lived down the street from me. Then I could come over and eat lunch at your house and we could say "monger monger monger" together. I would bring the drinks. 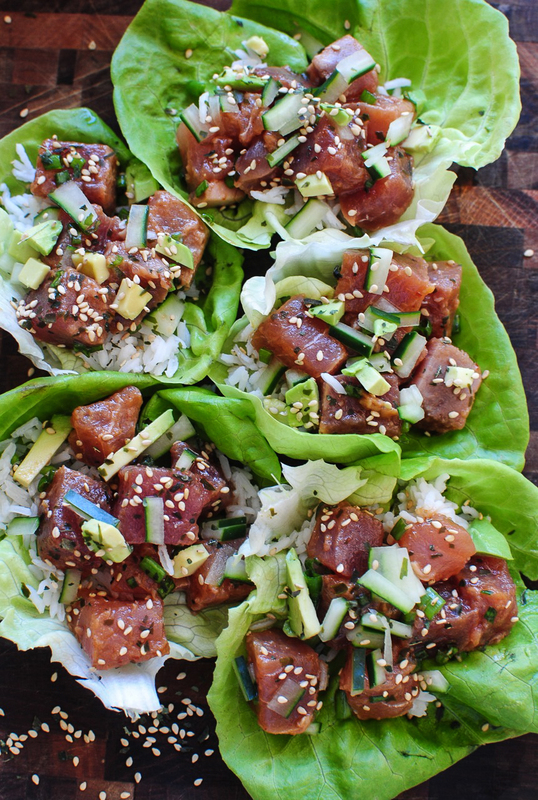 I do a poke bowl but trying to go light on the rice, so I will make these wraps instead! They look perfect! Recipe looks lovely- can't wait to try it out! I currently work for a seafood market in Montana, and for those of you worried/wondering about eating raw fish: Look for #1 and #2 ahi tuna, both of which are sushi grade. #1 is slightly better than #2, but any market that differentiates the two is a good place to be buying your fish!